Buck’s T-4 is located in the stunning Gallatin Canyon, just fifteen minutes from the lifts at Big Sky and 45 minutes from Yellowstone National Park. A full hot breakfast, with eggs, meats, potatoes, pastries, cereals, juices, fresh fruit, etc. is included in all room rates. The restaurant at Buck’s T-4 has been recognized as among the finest in Montana and the skiing community. Chef Scott Mechura brings together a unique combination of traditional local ingredients and classic culinary techniques. 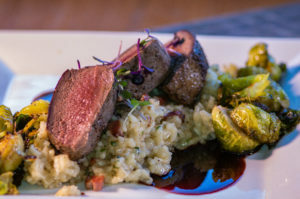 The menu features wild game, hand-cut steaks and daily specialties.Learn More. **PLEASE NOTE: The restaurant at Buck's T-4 will be closed from April 7-May 24, 2019. Specialty food items from Montana's favorite restaurant. 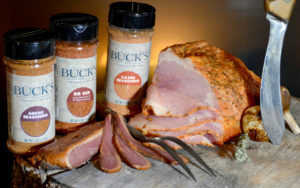 Cured meats and custom spice blends, shipped right to your door. Buck’s T-4 Lodge has been a Big Sky tradition for over 50 years. Visitors to Big Sky Ski Resort and Yellowstone National Park experience unparalleled hospitality and the genius of our cuisine. Buck’s is also uniquely equipped for your wedding, meeting group or family reunion. In the summertime, we offer great value room rates and activities, and in the winter, we have the best skier room rates in town. Come experience warm Montana hospitality at Buck’s T-4. 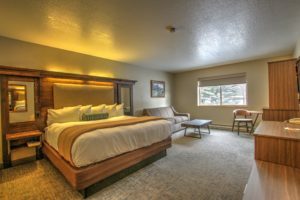 Our welcoming atmosphere, nationally acclaimed restaurant, hearty breakfast and many amenities make us the natural choice for lodging in Big Sky, Montana. Our guests enjoy the Biggest Skiing in America at Big Sky and Moonlight Basin and find us a convenient and restful spot as Yellowstone's Base Camp. 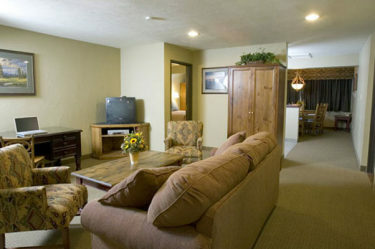 Whether seeking a ski adventure, a relaxing getaway or a productive meeting, Buck's T-4 Lodge in Big Sky is the place. Experience the best in Big Sky lodging. My family has enjoyed visiting Buck’s T-4 for the past 20 years. Our boys grew up skiing at Big Sky and eating our special “vacation meal” at Buck’s T-4. Buck’s T-4 is our favorite restaurant. The food is always superbly original and unique. The bison tenderloin is the best bit of red meat I have ever put into my mouth. Period. We visited Yellowstone in the month of September and Bucks lodge is almost 30 miles from NP, but the scenery along the drive makes it up. Rooms are nice and beds are really comfortable. Ok, now comes the breakfast, I would say it was the best breakfast we have had in recent times. Definitely will stay again. When I heard Buck’s T-4 had a continental breakfast, I set lower expectations – wow – what a pleasant surprise!!! They ought to call it a breakfast buffet! The hotel portion was nice, clean and completely pleasant, but it is such a treat to have a hot breakfast – I can’t say enough great things about that part. The staff was super!!!! Service was, well, just ask for something, very, very nice. MPA has been going back to Bucks T-4 Lodge now for a number of years, and their friendly staff, awesome service, amazing food, and comfortable sleeping rooms are always very consistent. They make my job so much easier!! I would recommend them highly, and look forward to next year! I planned an event for a client at Buck’s T-4 and the entire process from booking the event with Valerie, to the great food we experienced at their wonderful restaurant, to the fact that Chuck, the co-owner, not only drove our people to their fly fishing excursion, but also made breakfast for our group. I was thoroughly impressed with their hospitality and great service. – Richard Oleff RLO Consulting, Inc.